Heat 3 cups of water in a pot until it's just about to boil, add lentils, and reduce to simmer for 15-25 minutes or until tender. While the lentils are simmering, you'll have enough time to make the entire meal. Saute onions, mushrooms, and garlic with a splash of oil until tender. Add seasoning blend and enchilada sauce at the end and stir. By now the lentils should be done! Drain and return to pot. Combine your seasoned vegetables with the lentils, along with the refried beans and heat on low, stirring gently to incorporate. Taste and adjust seasonings as desired. I decided to add an extra sprinkle of each spice -- feel free to follow suit! Bake your tortilla shells, prep your toppings, and assemble. 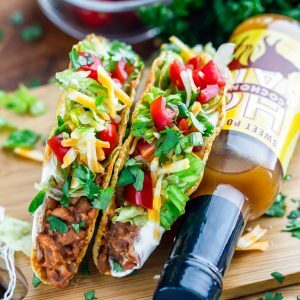 Since these tasty tacos can be either VEGAN or VEGETARIAN, simply choose the toppings that fit your lifestyle and you're good to go! I pretty much have this insane obsession with adding sour cream or vegan sour cream to my lentil + bean tacos so totally follow suit if you're a fan! The combination is delightful!